As you might expect, the cable saws through the side of its ferrule and the brazed-on frame fitting, because it’s been basically impossible (for me, anyhow) to find a replacement derailleur duplicating whatever the good folks at Easy Racers shipped back in 2001. On the upside, this derailleur’s cable entry has a nicely rounded ramp eliminating the need for my brass cable pulley widget. 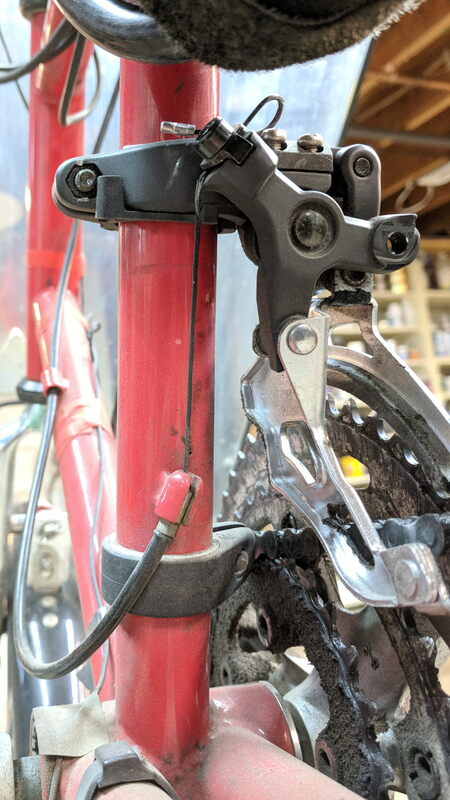 Memo to Self: Perhaps running the cable around a bearing anchored to the frame fitting would help? I’ve obviously forgotten to fix this for several years, so putting it here may serve as a Round Tuit.